We wanted to create an easy drinking craft beer in the traditional North American pale ale style that has proved so popular with discerning beer drinkers — so we did, and then named it after a hairy Mongolian cow thing. Fat Yak is created from natural ingredients, including premium malts, American Cascade hops and a hint of New Zealand Nelson Sauvin hops. On visiting Sydney, we make a beeline to the King Street Brewhouse on King Street Wharf as soon as we've checked in to the hotel - they have this on draft. Reminds me of great times and I was fortunate to find it on sale in a bar in London last year. Excellent flavour and extremely refreshing. Simply The Best! 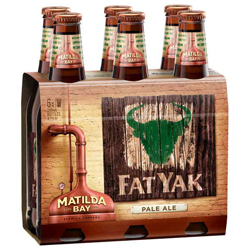 Australia has many excellent craft beers however Fat Yak tops them all! Best beer on the planet!! By far the best beer in the world let along Australia. Will be buying time and time again.